It's a pleasure for me to contact you. I am reading Trend Following and this make all sence for me. May I to participate of your community even been a beguinner? I read about you are a musician too, so if you can visit my web page at [link]. I was a professional musician during 30 years, and 6 years ago I have decided to change, and past 4 months I have discover the trade world, and I like it very much. Yes, you may participate by following along on this blog and by sending in comments. I notice your web page does not have an easy way to sample your style. For example, if you'd like to sample something I have in proces with my son, follow this link. Thanks so much for your time recently in beautiful Puerto Rico. At the end of our 2nd session we discussed a formula for ranking securities which contained a denominator using volatility. As to the volatility component, I have considered using the dollar amount of average true range or the actual historical volatility of the security. Any thoughts you would share as to this would be most appreciated. You can normalize the strength of an instrument for volatility by dividing its strength by an index of its volatility. R = A25 - A125. S = (A25 - A125) / A125. VNS = S / V (fraction). VNS = (A25 - A125) / ATR(25) (fraction). In English, the Volatility-Normal Strength equals the Reach / Volatility. You can compute VNS for all your instruments and then rank them by VNS. Of course, following this example, you can use other formulations as you wish. 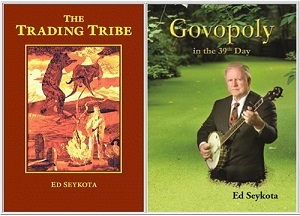 I have just finished reading your book, The Trading Tribe, which I found fascinating. At little about me. I've been an aspiring trader for quite a few years now, with varying degrees of success. I've become convinced that "I" am my biggest obstacle to my own success. Looking inward, I have researched and tried many tactics and techniques to address this problem; all without much benefit. After re-reading your chapter in Market Wizards, I ordered your book and a light bulb went off. I am ready to go to work. I live most of the year in Denver, CO but spend part of my time in Texas. I am interested in learning and participating in your Trading Tribe with the idea of, upon returning to Colorado next spring, starting up a Tribe in the Denver area. From your website I understand you have a Tribe here in the Austin area. If this is a possibility, please forward information I might need or which you might require of me regarding my participation in the Austin Tribe. p.s. Love the Whipsaw song! You might consider watching this blog for information on a new Tribe series in Austin, or in Puerto Rico - or on a Workshop. According to your answers of the email "contradiction" of 6th of October, I notice that our body and physical sensations are accompanied with thoughts, visions, images, commentaries (by our internal voice) ... what to do with them? How to experience them in TTP?? In TTP we encourage you to amplify your physical sensations and forms. If you find you have a need to talk, to express your internal voice or to make other commentary, we generally encourage you to go with it, until you can identify the body feeling that informs your need to talk. Some people use talk, commentary, analysis and other logical activity to forestall getting into their feelings. In this case we might say to Hotseat, "OK then, crank it up and really talk a lot. Make your words as loud and as fast as you can." This generally brings the client back into his feelings. In general, we go with whatever the client presents during the process. Please can give advice about what works on these days on markets? I can pay you a lot of money but I need a trading system used by big professionals. You can see my terms for private consulting at Resources, above. If you just want to pay me a lot of money for a simple system that works, without having receive the consulting, I can also accommodate your wish. You might consider (for free) that all your systems already work, in that they deliver the results they intend to deliver. Likewise, you, as the manager of the system you choose to operate, also get the results you intend to get. You might consider doing some back testing on your systems to find out how they work, before you employ them. You might consider taking your feelings about <nothing works> to Tribe as an entry point. "The best thing you could do for anyone that you love, is be happy! And the very worst thing that you could do for anyone that you love, is be unhappy, and then ask them to to try to change it, when there is nothing that anybody else can do that will make you happy. If it is your dominant intent to hold yourself in vibrational harmony with who you really are, you could never offer any action that would cause anybody else to be unhappy." Thank you for sharing your affirmation with me. I understand that one can celebrate their positive feelings, but does one celebrate their negative feeling. That sounds like a contradiction. Thank you for acknowledging my work and for raising this issue. In TTP we experience our emotions and feelings as body sensations, such as pressure in the chest, tightness in the neck, heat in the face. Then, with group encouragement, we practice experiencing these physical sensations, joyously and without judgment. Once you take the judgment (positive / negative) away from a physical feeling, you can more easily celebrate it and appreciate it for its role in bringing valuable information to you. You might consider taking one of your favorite feelings to Tribe as an entry point. I am not taking the TT chart as trading advice at all. My silly system is fully automated and I strive to keep my hands off my system. |-) I trade lightly on this first system of mine, and am able to take the feelings of following it. I care more about the confusion of my belief system than current specific market situation and share with you my confusion and insecurity about my belief. Thank you for acknowledging my feelings! I am having a debate with [Name] for a while. He is against my simple long term system with 200/100 SR configuration and insists being more flexible on time constant, considering relative strength, portfolio selection etc. It looks like I lose the debate. I am working full time on improving my testing and trading platform, adding GUI, 2D, 3D charts, missing features, account management interface etc, making further effort to test more ideas. You can evaluate systems by back testing to find out which system produces the best fit for your personal Bliss Function. People naturally have different Bliss Functions, particularly in the matter of drawdown tolerance and patience. Some people can handle big drawdowns and some can't. Some people can sit on a position for months while others like more frequent action. 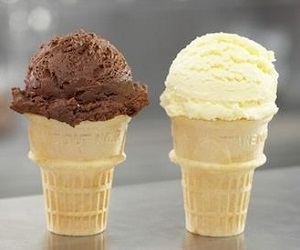 Some people like chocolate; others prefer vanilla; some go back and forth. You might consider taking your feelings about <debating> to Tribe. and some like to debate. 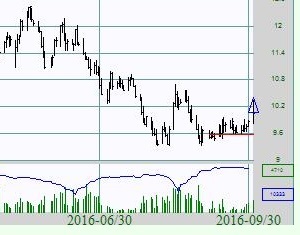 I am looking at the TT chart for Oct 3, and I see the Long only strategy chart has buying signal of the rough rice. I am feeling really confused. The long term trend is obviously down (unless there’s a EMA crossing not shown on the chart?) and it’s only probably 20 day’s high if it use a SR for entry. It almost like a bottom picking system. I didn't save past charts, I wonder if the system also makes a signal in early April? It feels not compatible with your less sensitive, slow style. I feel threatened by your bullish signal. I am shorting grains with very insensitive trend days parameters. I feel some cuts in my chest. Red line shows protective stop. "I do not make or imply any kind of recommendation to buy, sell, hold or stay out of anything. I advise proceeding boldly, in your own way and with caution and sound risk management in trading and in life in general." Different systems give different signals. Some very simple systems use a couple long-term moving averages. Other systems may consider trend lines, patterns, relative strength and other factors. You might consider taking your feelings about <cuts in your chest> to Tribe as an entry point. How do you feel when Larry Summers floats the Fed buying stocks? As the Govopoly System grows and the Freedom Index falls, the Free-Competition Sector slows and then decays. When the Govopoly System runs out of assets to assimilate, it also goes into decline. Central banks have a powerful tool: namely, they can create more debt. This enables government to spend without having to impose direct taxes. Debt, however, cannot replace the competitive spirit of the Free-Competition Sector. Lately we see this showing up as the Free-Competition Sector declines into a complex web of regulations - while the Fed "pushes on a string" by providing debt at zero, even negative, interest rates. Central Bankers justify creating more debt with the Keynesian theory that aggregate demand (private spending + government spending) supports prosperity. Actually, Free Competition supports prosperity. Government spending supports inflation, misallocation and the growth of the Govopoly System. As Assimilation proceeds, the Govopoly system has to resort to increasingly inventive methods to forestall the symptoms of decay, such as forgiving student debt, restricting imports, restricting immigration and, lately, even buying stocks. You might expect the Govopoly System to continue to assimilate Free-Competition Sector assets - and to continue to mask the symptoms of a barely-productive economy with the generation of more and more debt. You might look for a continuation of some secular trends: lower standard of living; less personal freedom; lower productive employment; more social unrest; commodity prices working their way higher, in very irregular and volatile waves. For more on this, see my book, Govopoly in the 39th Day, above. 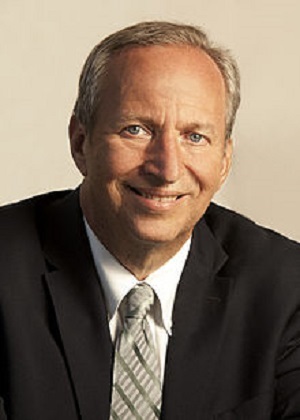 Per your question: As I witness the Govopoly System assimilate freedom fighters like Larry Summers, I feel some sadness for the loss, some satisfaction for the verification of my theory and some gratitude for the opportunity to witness these developments. There is a great deal of absurd political correctness. Now, I’m somebody who believes very strongly in diversity, who resists racism in all of its many incarnations, who thinks that there is a great deal that’s unjust in American society that needs to be combated, but it seems to be that there is a kind of creeping totalitarianism in terms of what kind of ideas are acceptable and are debatable on college campuses. To the extent that low neutral rates are in part the consequence of investors preferring fixed-income assets and steering clear of riskier options, policy-makers can combat that by buying risk assets.